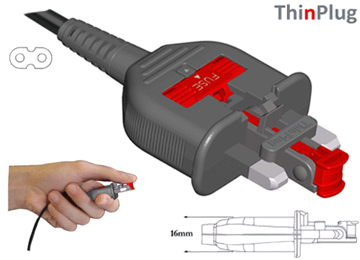 ThinPlug products do not scratch equipment, fits through letterboxes and are also elegant. Several items of portable electronics have become a feature in most households. As laptops, music players and digital cameras in fact all the portable equipment with class II connection have proliferated and are being produced ever smaller for convenience, the standard UK plug. For many years it didn't need to change but with the advent of new portable electronic technology in recent years it has become almost an embarrassment to find that the standard plug with its bulkiness, thickness, heaviness and protruding pins which comes with sold equipment is bigger than the product!